I know you’ve been waiting on pins and needles for a new build update, and today is your lucky day! 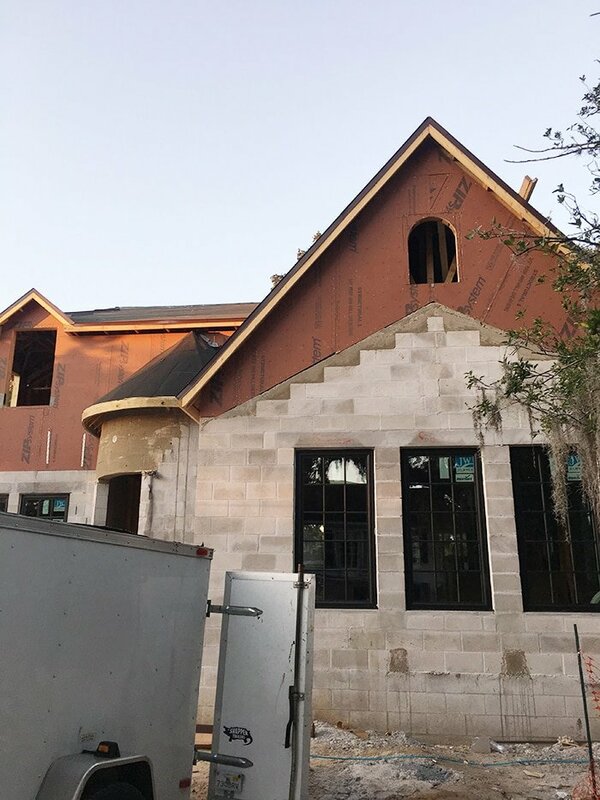 It has officially been 10 weeks since our lot was prepped, and since then it has felt like Christmas morning every few days as we check in on the progress. 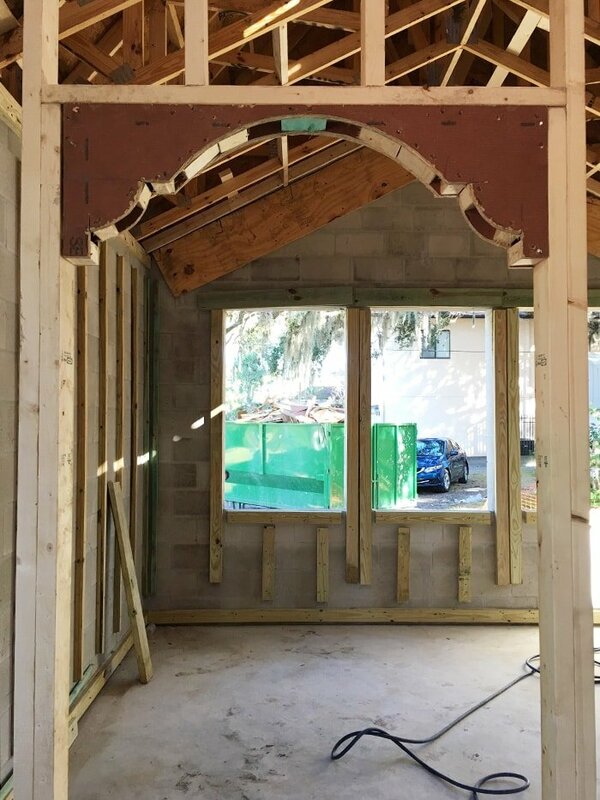 Ours won’t have the keystone at the top, but I love the shape/texture of the frame and the illusion that the arched shape gives without having to spend double for arched windows. 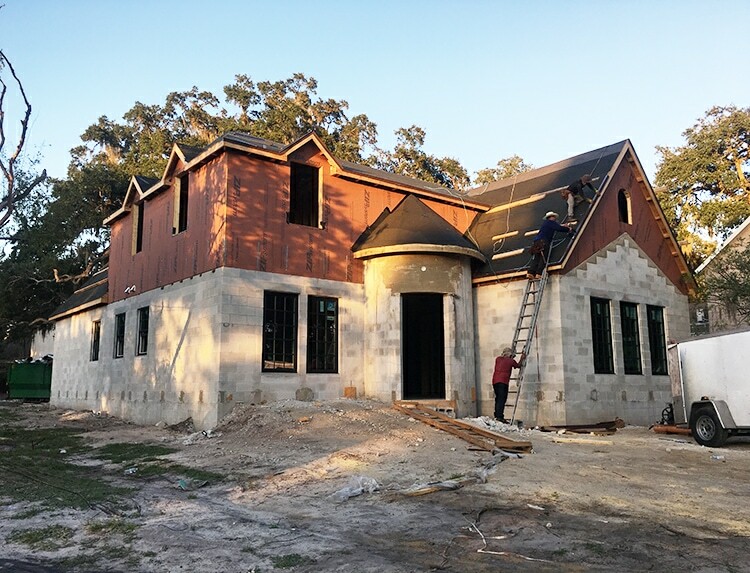 Our builder (Zenun Homes) works with a talented exterior finishes guy who we met at the site to discuss our options, and he said that he’d be able to recreate this look without a problem. Since everything we’re doing is custom, we don’t have examples to look at so we’re hoping it all works out like we think it will! 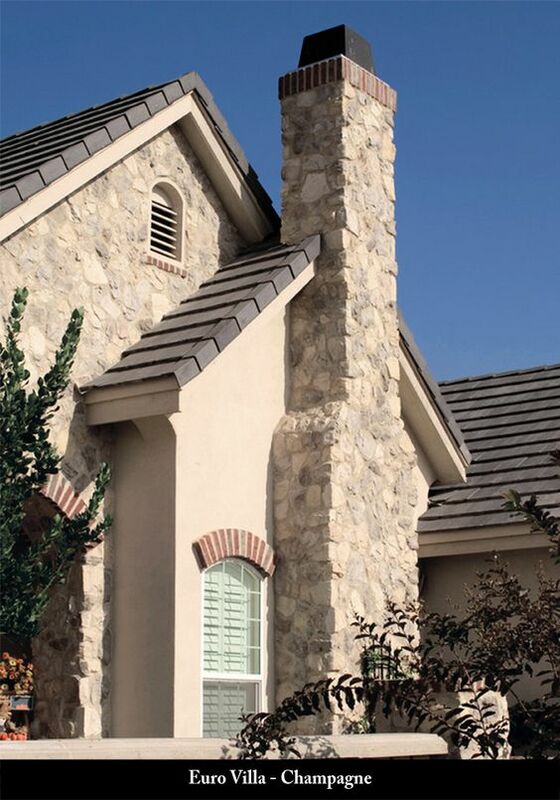 We will be choosing our roof shingles this week (yay!) so I’ll be able to share that in the next update. 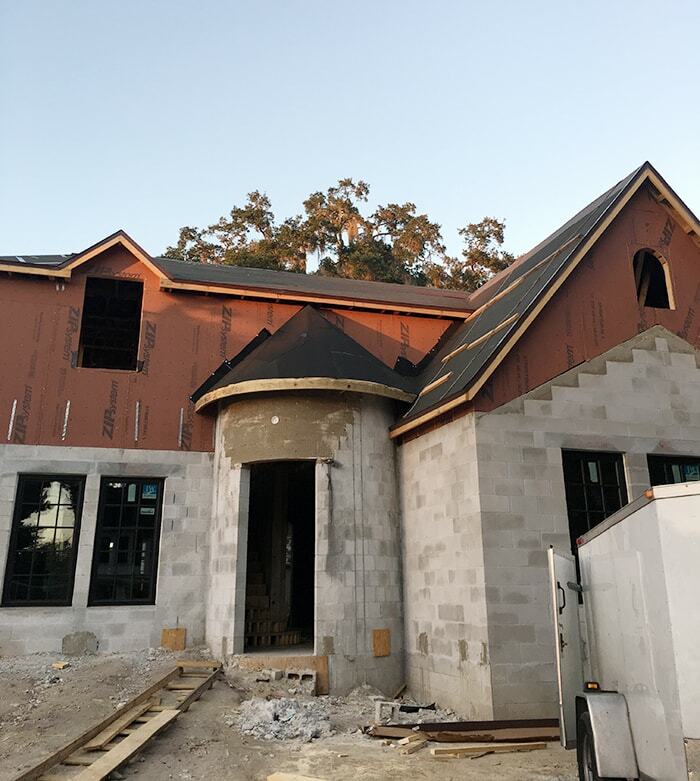 And we’re still planning to use a warm white smooth stucco, dark bronze fascia & gutters, light warm gray shutters for the front door & accent window. Can you picture it yet? 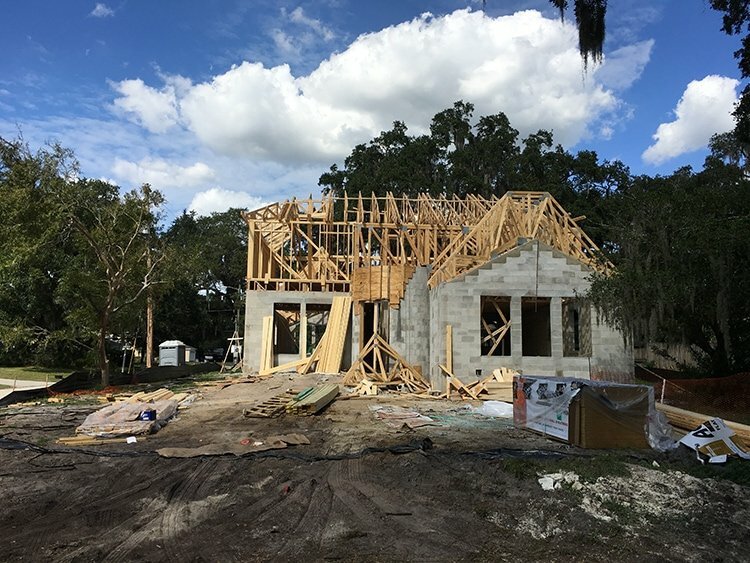 The vast majority of new builds around here are block construction for these reasons, but it does come at a higher cost. 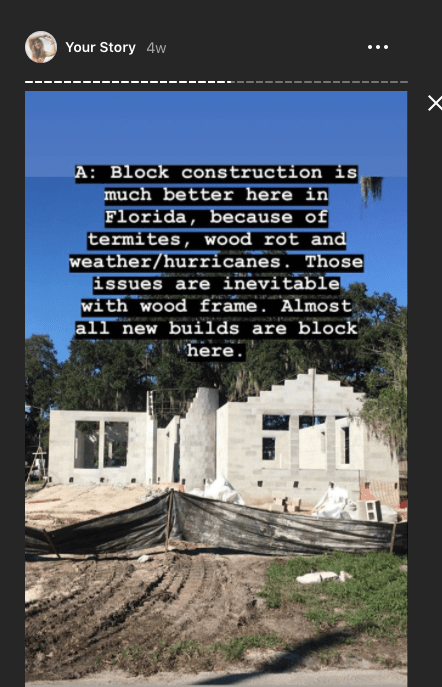 Second stories are often built with wood frame, which you can get away with since it’s not part of the foundational structure rooted in the ground. We’re on a corner lot and this side will be exposed, but we plan to add trees and shrubs for privacy and shade. 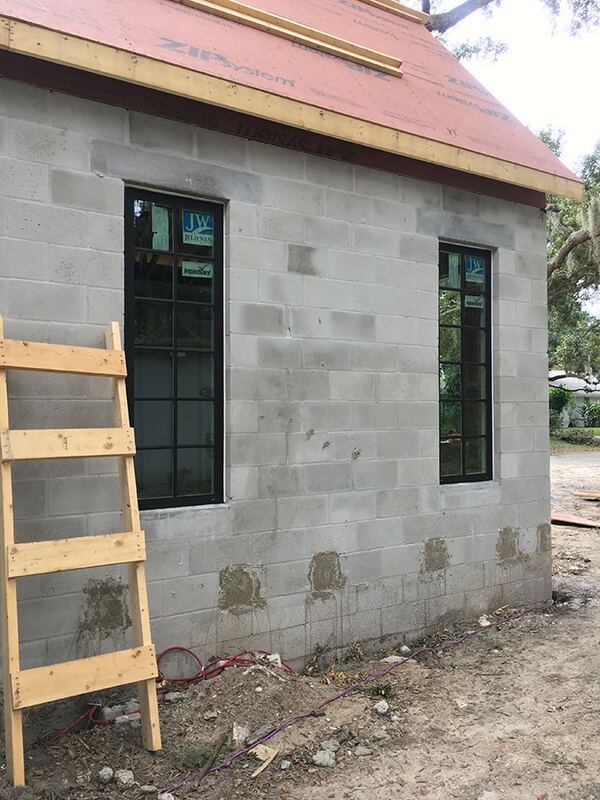 As you can see we’re still waiting on the upstairs windows to be installed—they’re all the same Jeld-Wen black exterior/white interior (I’ll do a detailed post on them soon). 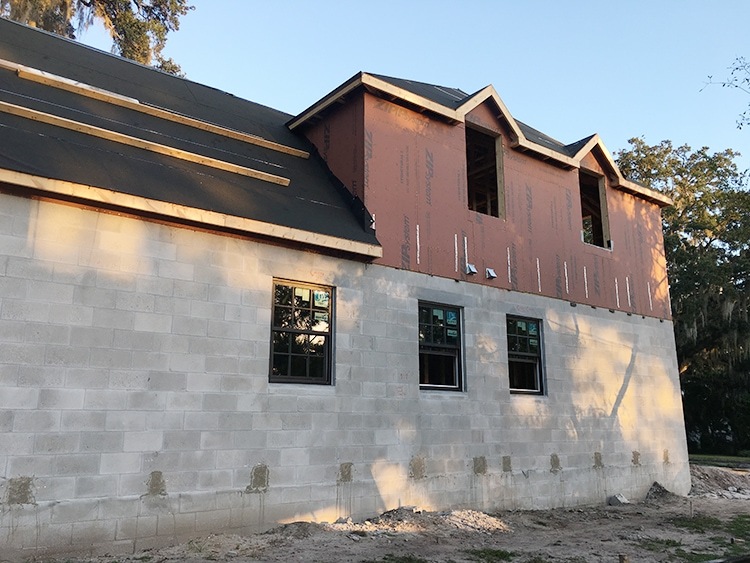 From left to right in the photo above, downstairs we have the window for the master closet, master bath, and guest bath. The two windows upstairs go to the two bedrooms. The backyard is one of our favorite views. There’s a large oak tree covered in Spanish moss that extends well beyond our 10,000 sf lot. Above you can see our master bedroom section on the right. Eventually we plan to build a patio in this area off the house for dining and lounging. 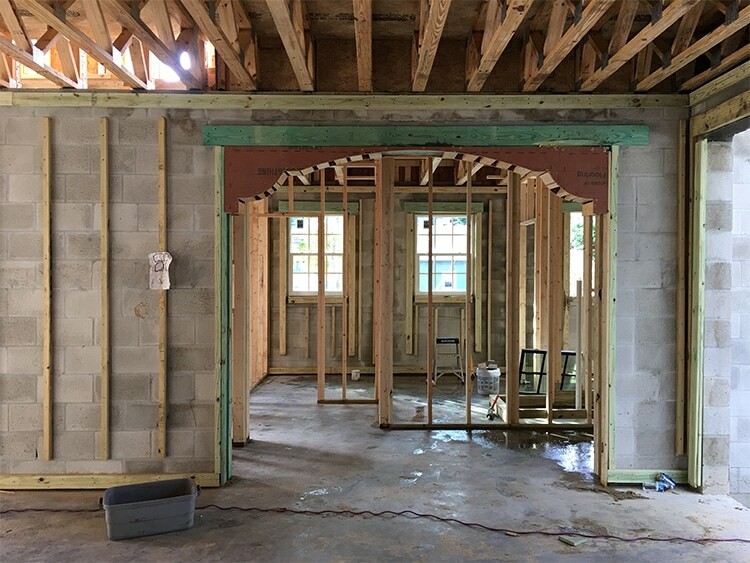 The three windows on the lower left are part of the kitchen (the sink will be below the center window), and the opening to the right will contain our 8′ french doors. 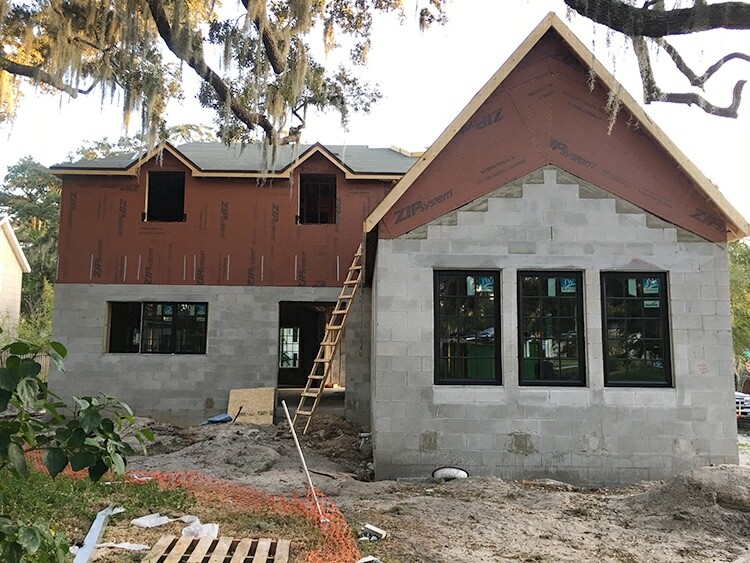 The skinny 2×6′ windows on the far right are on another wall of our master bedroom, and the upstairs windows go to the bonus room (left) and a bathroom (right). Another look at the skinny windows… sigh. 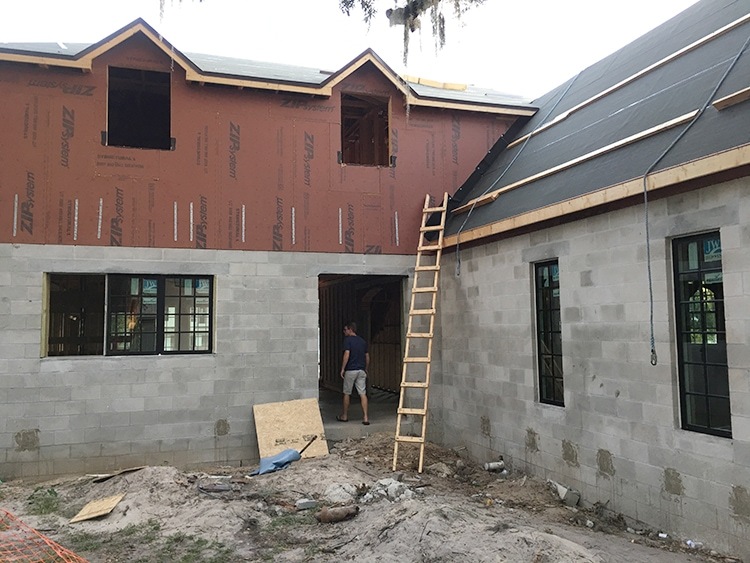 Back in the front, the two windows on the lower left go to the office/smallest bedroom, above that is a third bedroom, and the right side of the house is our living room. 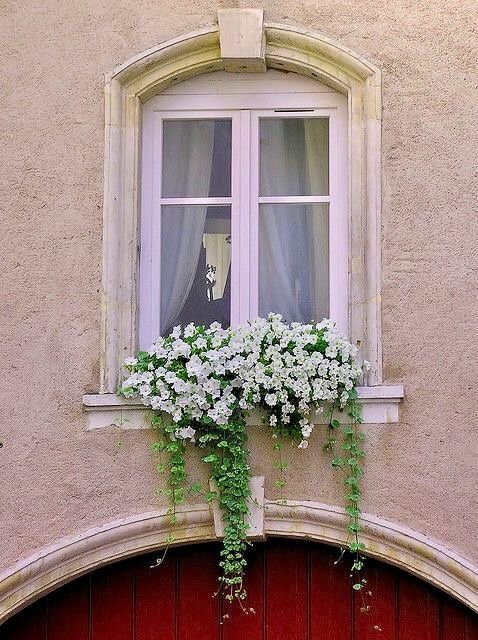 How fun is that little arched window? It was the only one we could afford! 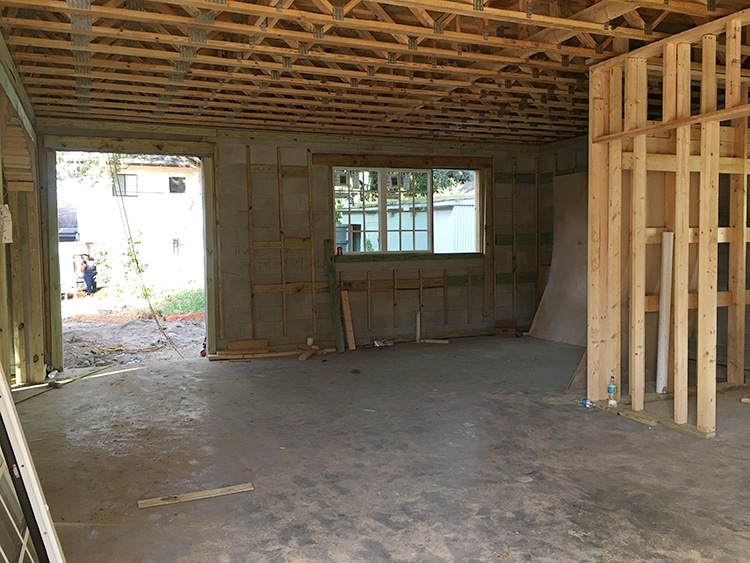 I still can’t believe the house looked like this just two weeks ago! 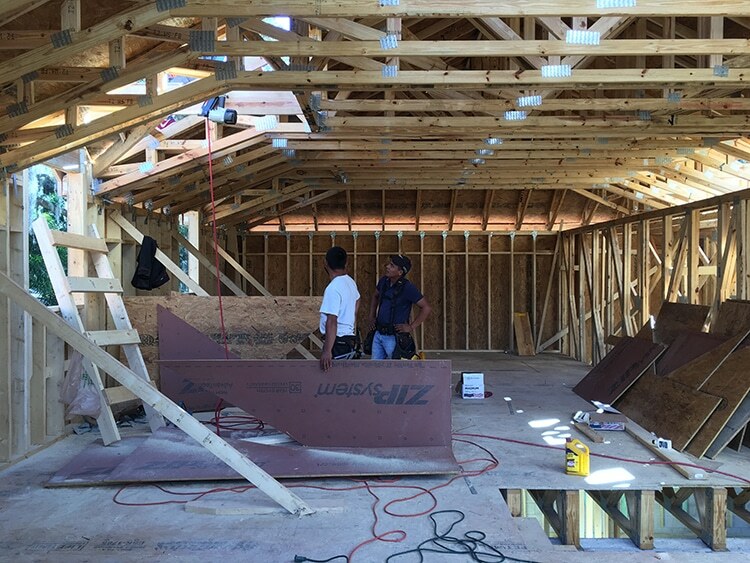 Our builder says our truss system was crazy complicated and there was a lot of problem solving to build the conical roof on the turret. 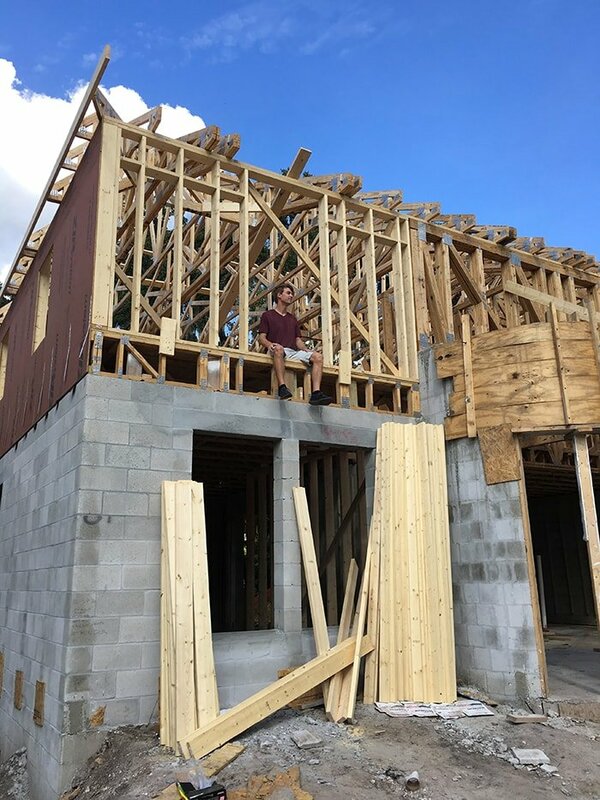 I guess this is what happens when you DIY the plans from scratch 😉 We are eternally appreciative for his patience and determination to make this perfect! It’s as close to waving a magic wand as you can get. This crew is unbelievably quick and talented! To the right of the staircase, the front door opens up into the living room/dining area, with the kitchen in the back. 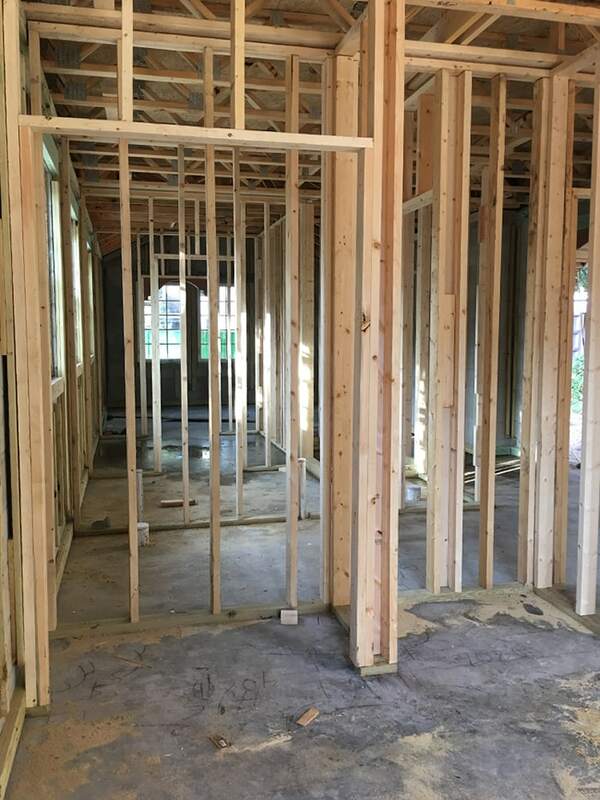 Here’s looking straight into the open dining space, with an opening for the patio doors on the left, bank of kitchen windows in the middle, and laundry room/pantry closet on the right. 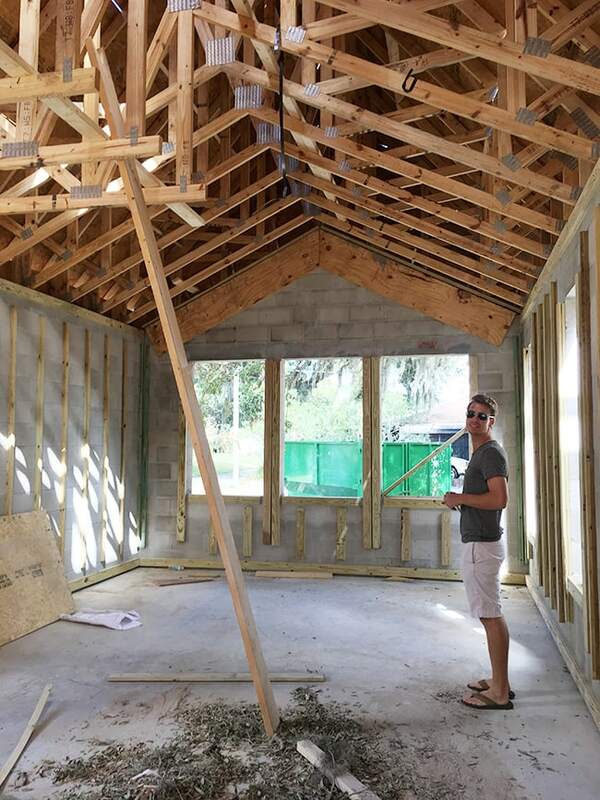 How bout that vaulted ceiling? 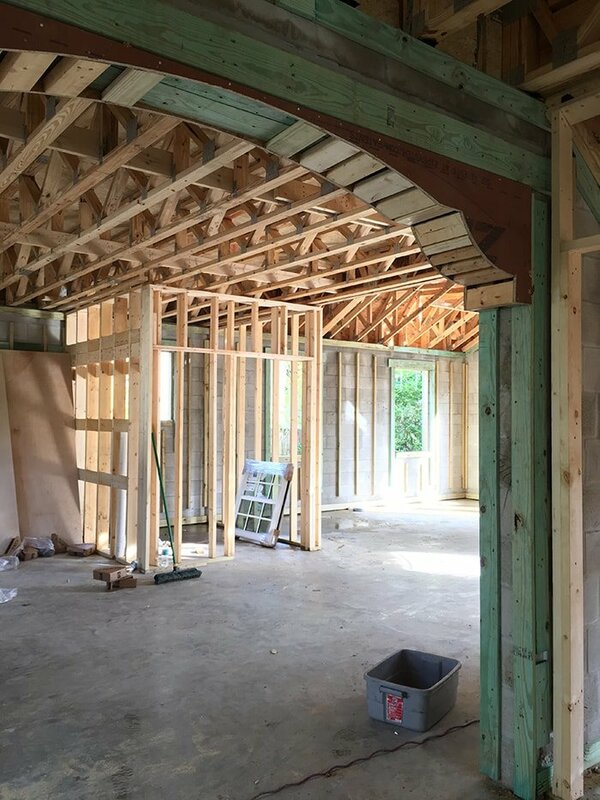 We’ll be adding straight wood beams running parallel to the floor. It’s not a huge room, but it’ll be gorgeous. And now back to the main kitchen area. 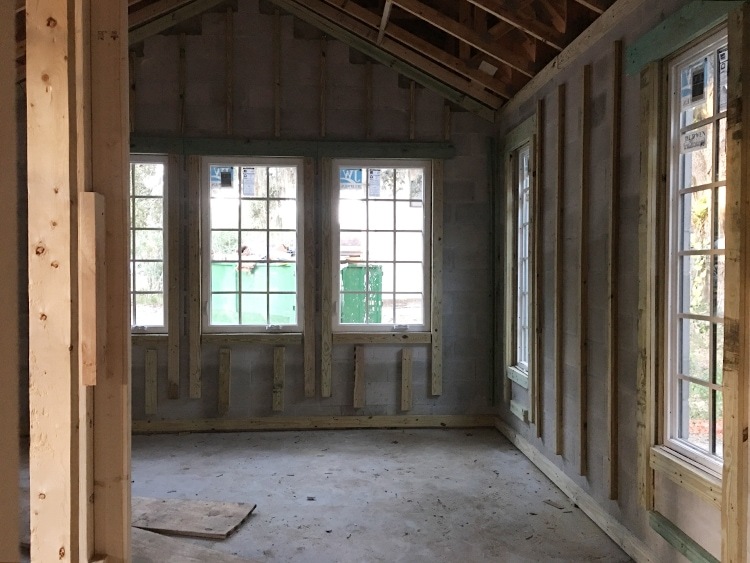 A 48″ stove with a custom range hood enclosure will be centered on that back wall. 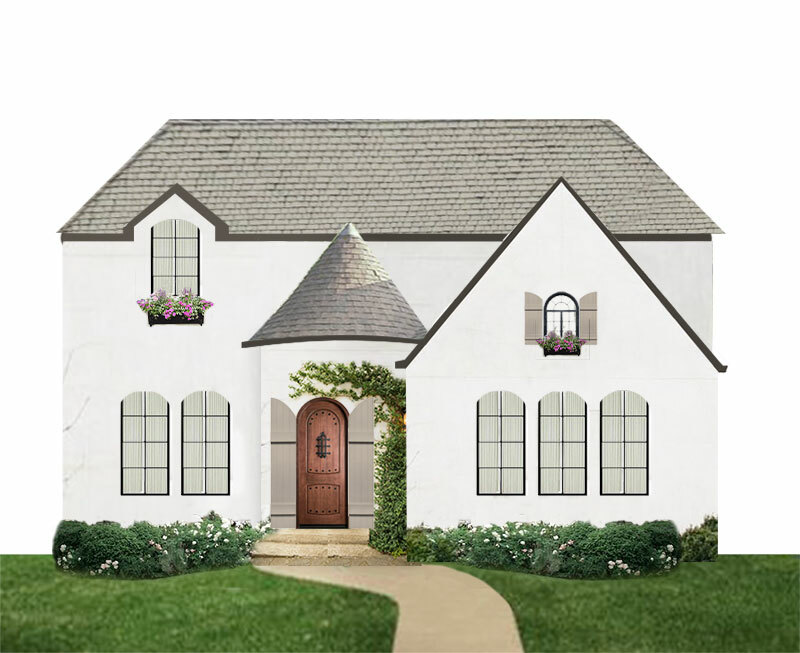 I designed this on the computer and sent it over to my builder, who said “consider it done.” Now that’s the language you want your builder to speak. We stopped by when they were in the middle of cutting out the shape and had them adjust the measurements until it was just right. 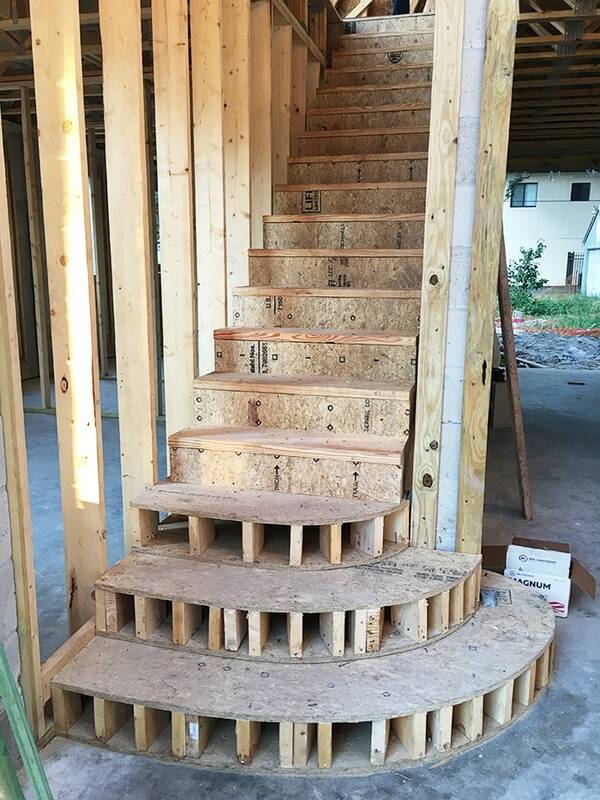 I’m not sure exactly how they finish it off, but I can’t wait to find out during the drywall stage. 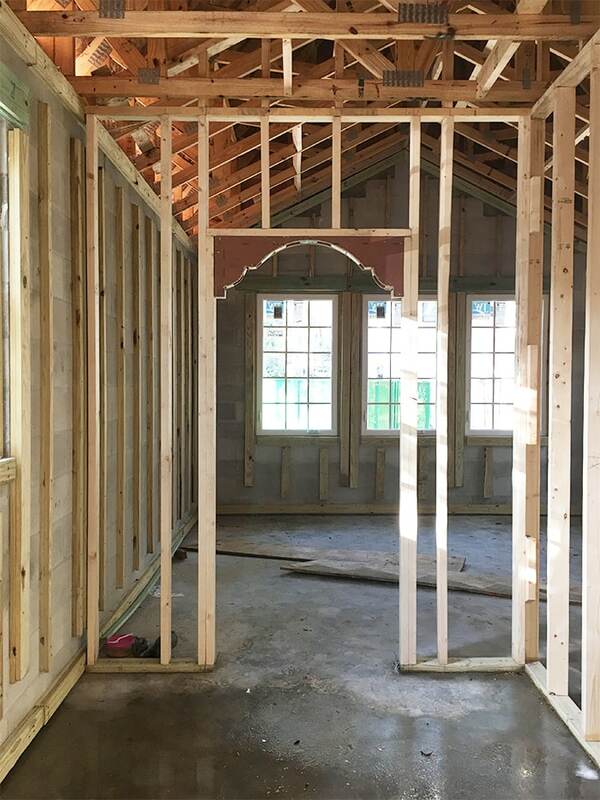 This archway leads to the master bed/bath, guest bath and office on the left side of the house. 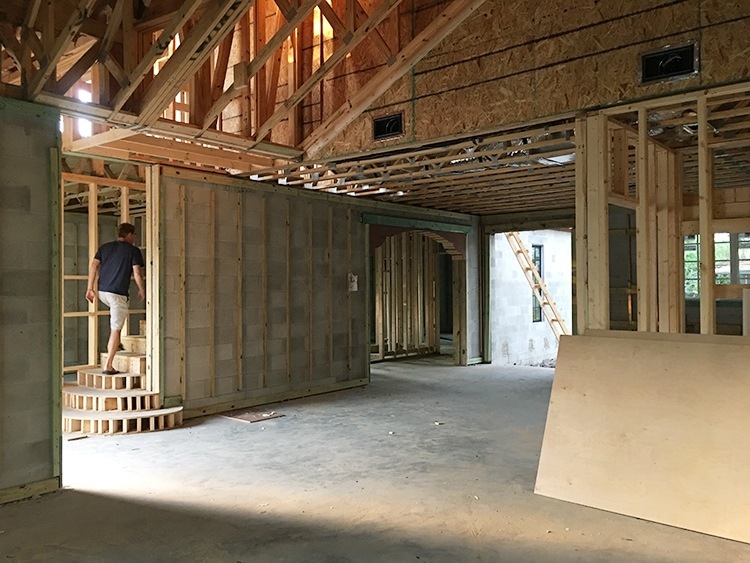 On the right you can see the under-the-stair storage closet (the living room is visible on the left). If you turn right to the back of the house, you’ll enter the master suite. 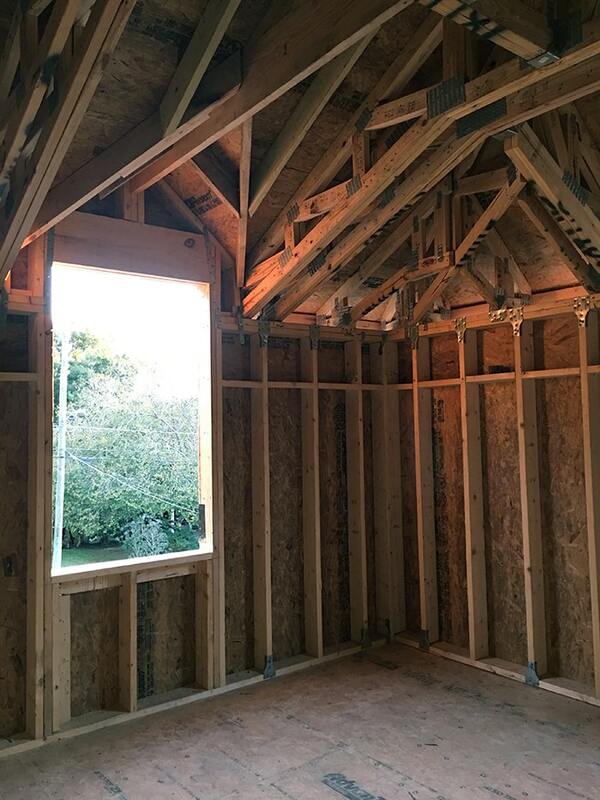 It’s not a very large room (around 13’x15′) but the vaulted ceilings will make it feel open and spacious. 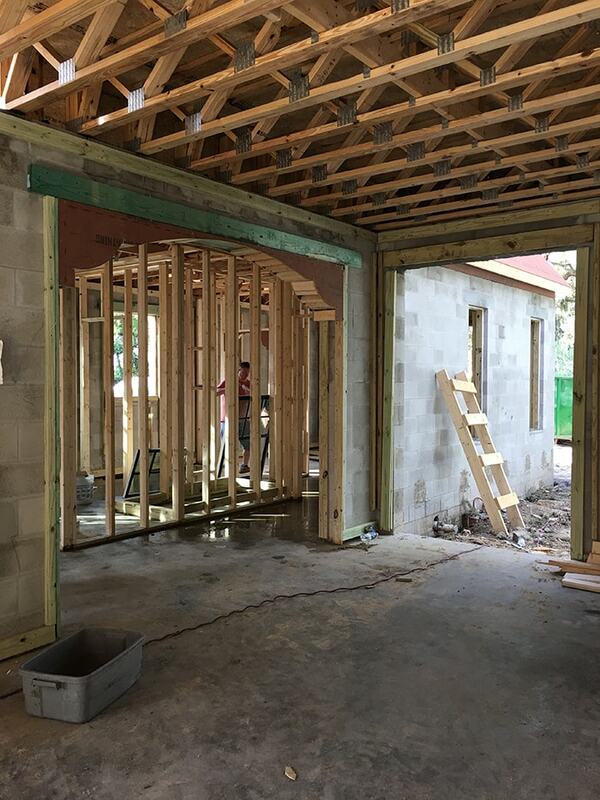 And guess what… WE HAVE ANOTHER ARCH! I had my builder make a condensed version of the same hallway arch for our master closet *swoon*. 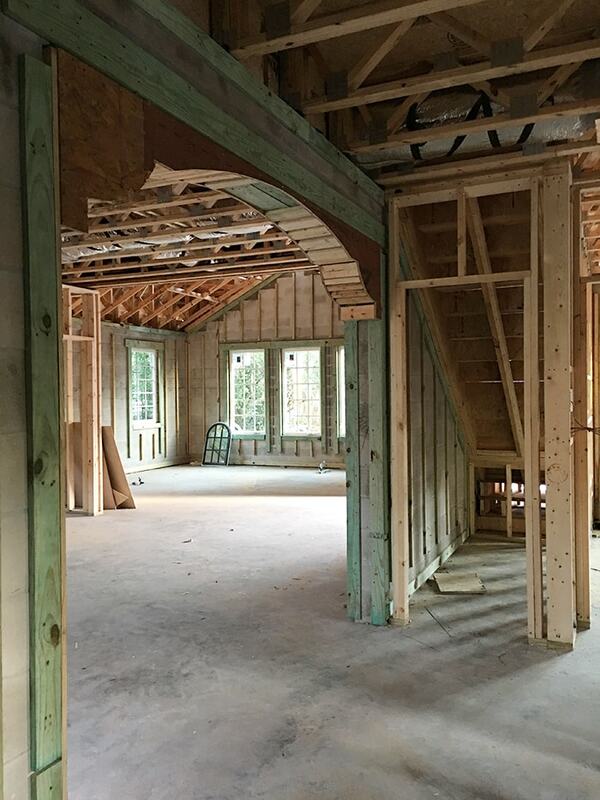 It’s an open hallway-style closet and will have custom floor to ceiling cabinetry on either side. This space is one of my most anticipated features of the home! Upstairs looks about the same at the moment. 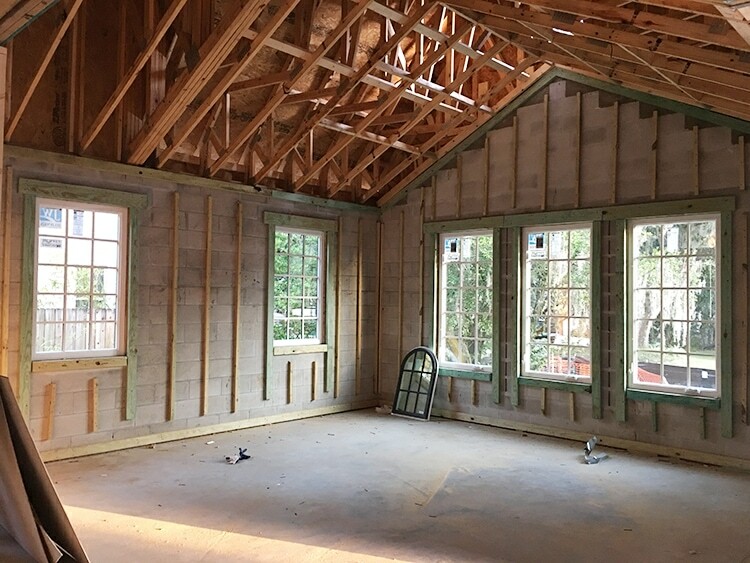 Two bedrooms, one bathroom and a bonus room within approx 950 sf. 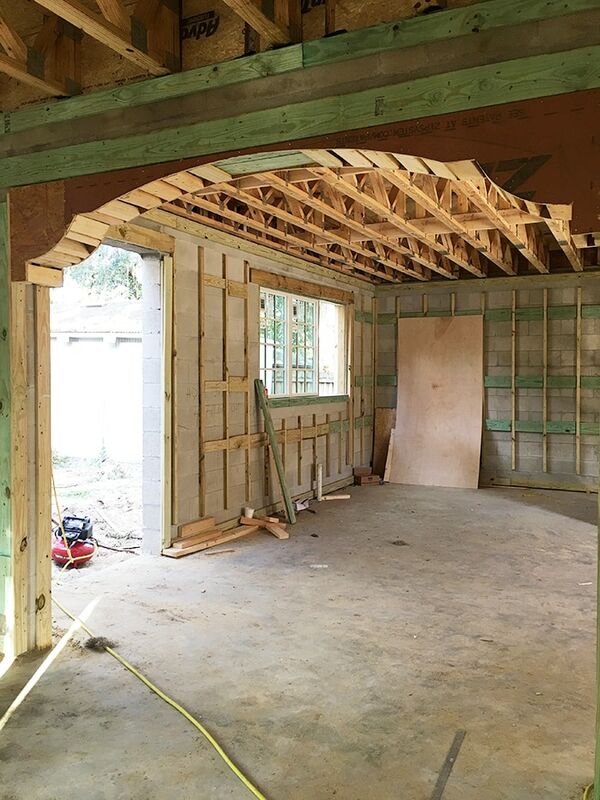 We originally weren’t intending to build out the bonus room, but this unexpected code requirement turned out to be a blessing because now we have so many options to utilize this space! If nothing else, it’s nice to have the extra storage room and space to hold out of town guests. 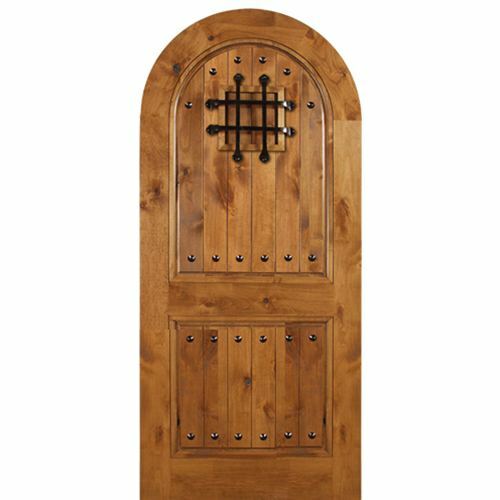 We wanted something you don’t see every day, and an arched top just seemed fitting with the front door and other accents in the home. I found these pre-hung solid core 7′ doors on Ebay and placed the order last week. There’s a 5-7 week lead time but we don’t mind the wait, as it won’t hold anything up. These will be so gorgeous painted in a soft warm gray with vintage style brass hardware! Counting down the days to their arrival. 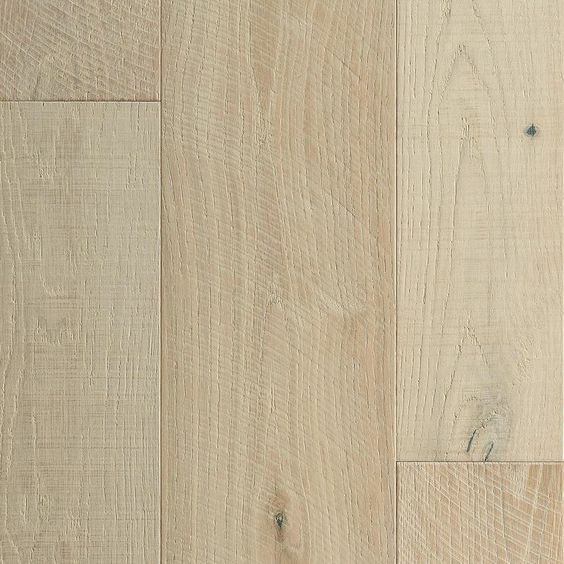 It’s an engineered French Oak in a beautiful handsawn matte finish, and $5/sf. The lead time is less than a week so we still have a while before we need to order. Stay tuned for our final decision! 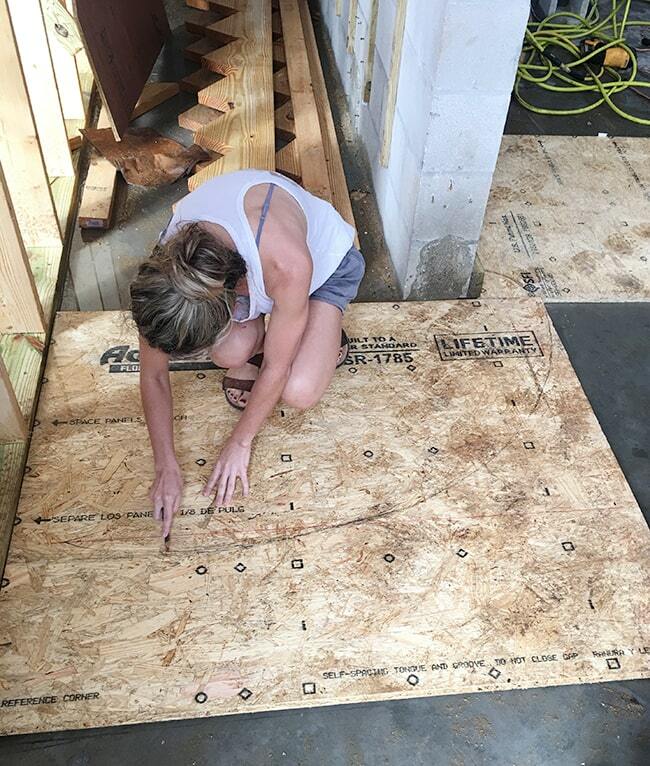 The plumbing is the trickiest part, since we have to have not only all of the fixture locations figured out, but we need the rough-in valves ordered and installed as well—which means we need to decide on shower fixtures. 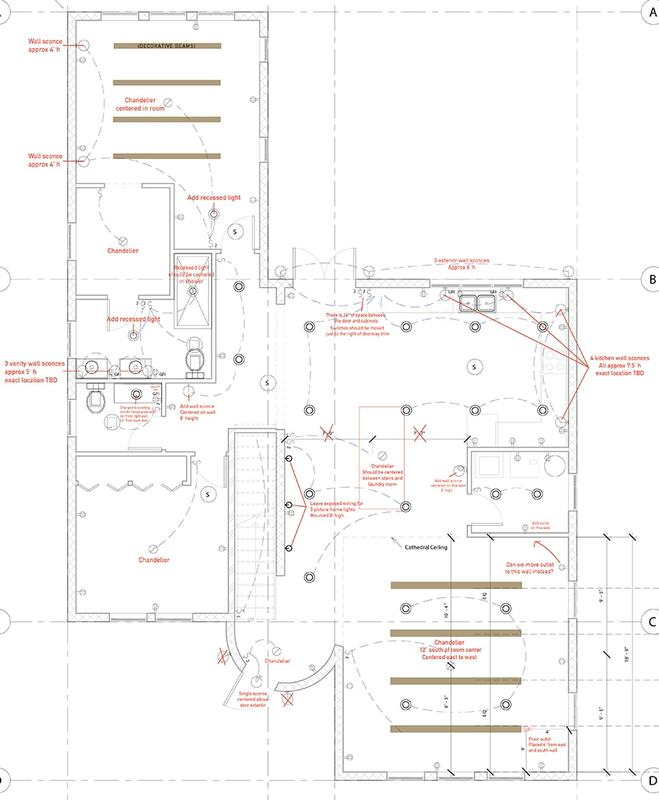 This poses a slight issue because I don’t have all of my bathroom design plans finalized, or even halfway figured out, and I can’t commit to anything without a complete design plan in place. 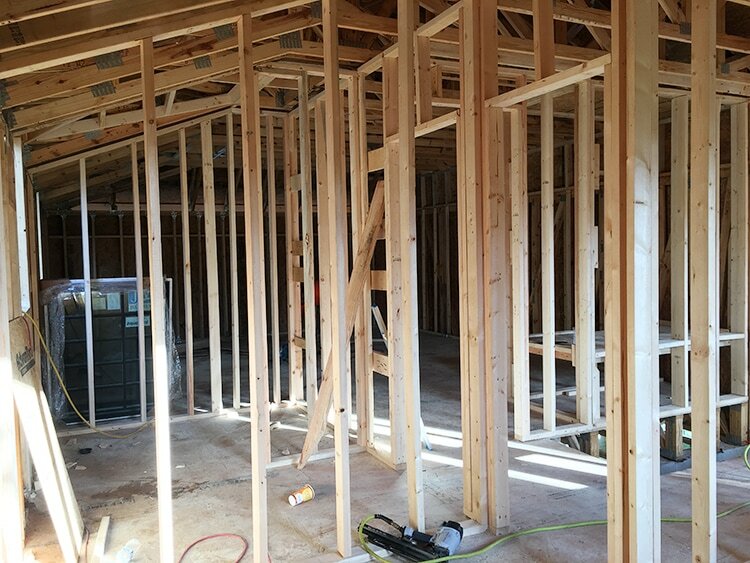 This is the trouble with building or remodeling an entire house at once! I know I’ll make some decisions I’ll come to regret or have to redo in the near future, but that’s the nature of the beast. 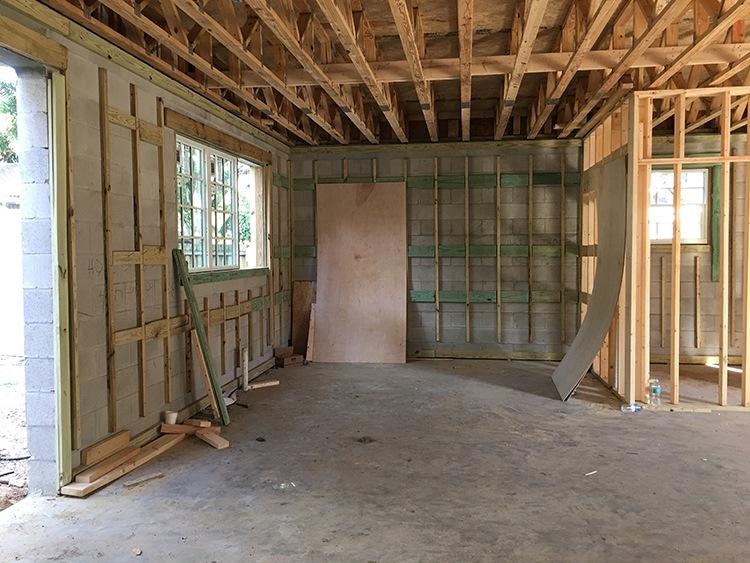 I know we’re not even halfway through this build yet, but I would trade remodeling old homes for building new all day, and going through this process has made us reconsider our options moving forward as investors. I don’t think this will be the last custom home build I’m involved with. We’ll see what the future holds! If you aren’t following the new build progress on my Instagram stories, make sure you head over now and catch up on everything you’ve missed! I try to update at least weekly, and will be sharing more frequently now that we’re getting to the fun parts. It’s really beautiful. Love the Spanish moss trees. Those will make it feel like the house has always been there. About the stairs…. Have you considered opening those up to the living area? The rounded part was a great decision, I’d hate for them to feel closed off. Thanks Mara! The concrete wall is necessary and structural, so there’s no way to eliminate it unfortunately. WOW! you had me at 48″ range!!!! and my eyes opened up rounder 🙂 its looking fantastic and all the arches are glorious. 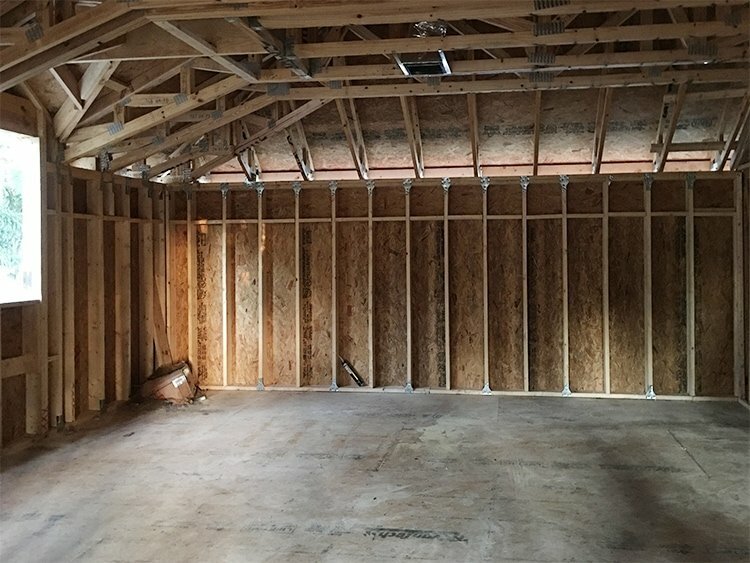 where will the garage be? maybe is not common in florida? This is looking amazing!! Love your arches, the closet, the layout, the style… It’s all so good! Those are great builders! 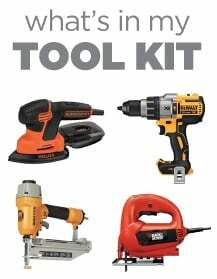 I keep hearing complaints about carpenters telling clients that what they want is too hard or can’t be done. Your guys are awesome! I also like that the rooms are not huge- it will make it feel so much more cozy that way- and easier to decorate(imo). Very exciting!!!! Boy, it sounds like you have a great builder. It must be a little challenging with all the decisions – looking at the electrical layout made me dizzy and I had to move on without really looking at it. Did you ever find out how the fire started? I seem to remember that it was an electrical fire but that supposedly the power had been turned off. You’ve sure made lemonade from those lemons. Thanks Barbara — there’s definitely a lot of decisions being thrown our way! I feel like hardest part is over though, now it’s all about executing the plans and working out the details. The fire investigators were never able to pinpoint a cause. So strange.